Selena Gomez’s Skin and YOU CAN TOO! Let me swoon for a minute. Her skin is youthful, plump, breakout free, glowing. So, why do we want anything to do with Ms. Gomez? Simply put, because she has clearly healthy skin. Her skin IS coveted perfection. And you can too. She has been cleansed, exfoliated and moisturized to a high shine. Her skin looks well taken care of because it is. Does your skin look like hers? Do you want it to look like hers? Many young clients feel their beautiful skin will continue to be a nonissue when that is simply not the case. Ladies, just because you can get by washing with water and hydrating your face with body lotion doesn’t mean you should. Do you want your beautiful skin to stay with you over the years? If you are one of these people the question you should be asking is: What can I do for my already good skin? How do I keep it nice? These types of questions are not often asked. However, we do hear many mature clients muse “I used to have such great skin when I was younger”. This is a call to action for all young beautiful, plump, glowing, dewy fabulous girls out there! Your skin will never be as beautiful as it is right now. So protect it and KEEP it that way. We see countless young women with beautiful skin taking it for granted by not wearing sun screen. The sun is THE aspect of human life that ages us the MOST. I want everyone to understand the importance of sunscreen. As if the risk of skin cancer isn’t reason enough, let me tell you what the sun does to your skin from a purely vain point of view. The sun’s ultraviolet light penetrates through the skin (also through glass and clothing) and destroys Fibroblasts. What are Fibroblasts you ask? Well, they produce collagen and elastin. You know, the stuff that makes young people look so darn pump and gorgeous. Once the sun has destroyed a Fibroblast it is gone. Forever. Over the years the damage compounds. 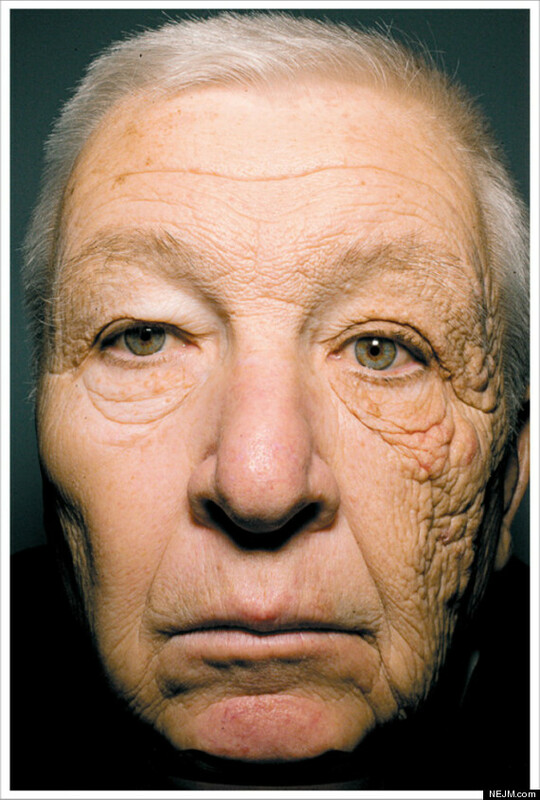 Bill McElligott, is sadly, a great example of the kind of damage lots of sun exposure can cause. The right side of his face is significantly more damaged than the left from years of truck driving. Compare and contrast my friends. Trust me, I know approaching this with scare tactics never works but even though you likely won’t look as extreme as poor Bill, you will lose your plump skin and you will have more fine lines and wrinkles than if you hadn’t been an avid tanner. This type of sun damage can usually only be corrected with more invasive treatments. Aside from clearly aging you by causing your skins support system to break down, over exposure to UV can also cause hyperpigmentation AKA age or liver spots. The damage that becomes visible occurred during childhood, adolescence or young adulthood can present itself as early as mid-twenties depending on the severity of the damage. Pigmentation is extremely hard to correct, so correction is oftentimes about being extremely vigilant with homecare and in-house treatments. Tanning beds are 10x stronger than natural sunlight. So everything I just mentioned in the previous paragraphs is magnified tenfold by laying down under those lamps. Let alone going back 3 or 4 times a week for years. Jane Iredale actually has a great self-tanner call Tantasia. It comes in a natural tone that isn’t orange. It renders tanning beds completely useless. For those of you who don’t actively tan in a tanning bed Jane also has her pressed powder makeup withSPF 25 or her Translucent Powder MeSPF 25. Both make reapplication so easy. It’s powder so even if you’re wearing makeup there are no worries about messing it up. Also, all her bases and sunscreens are Skin Cancer Foundation approved and free of anything that might sketch you out. There are no excuses now. You are well informed. Protect your skin. Later in life your face will reflect what kind of life you have lived. You want your skin to reflect that you have cared for your body and protected it. We are all aging. From the day we are born. If I could suggest just one product for Selena Gomez it would be sun screen, without a doubt.